This past November has been one of the gloomiest in Finland. 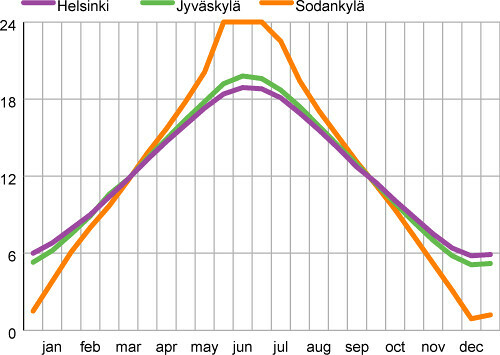 Besides the very few hours of daylight that there are at this time of the year, there were only 12 hours of direct sunlight  during the first 26 days of November in Helsinki (40 hours is the usual). In Lapland that number was up to 23 hours, which is still very few for those of us accustomed to lots of sunlight. A quarter of Finland’s surface – Lapland  – is over the Arctic Polar Circle. Over that imaginary line, at least a day per year the sun doesn’t set and at least a day per year the sun doesn’t rise. In rest of Finland, south of that line, it is not that extreme, but there are pretty steep changes in the hours of daylight during the different months and seasons as well. 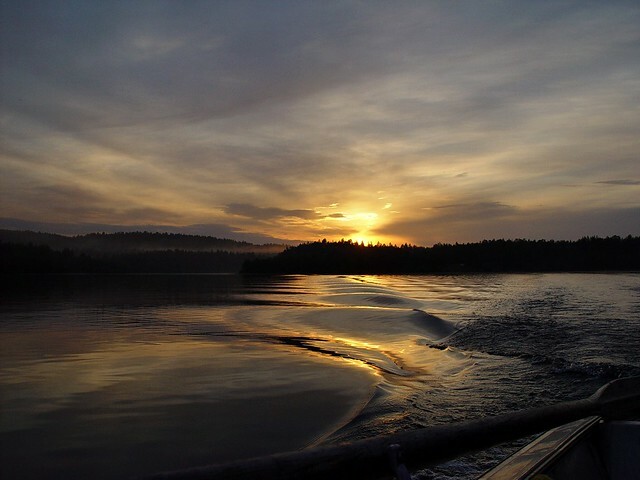 Finland has moments with a lot of daylight and sunlight: this is a photo of the midnight sun. Source (CC: by) . So, if we are planning our trip to Finland , either for tourism and discovery, or to visit someone we care for, it is good to know what we are going to find in terms of how long the daytime lasts. 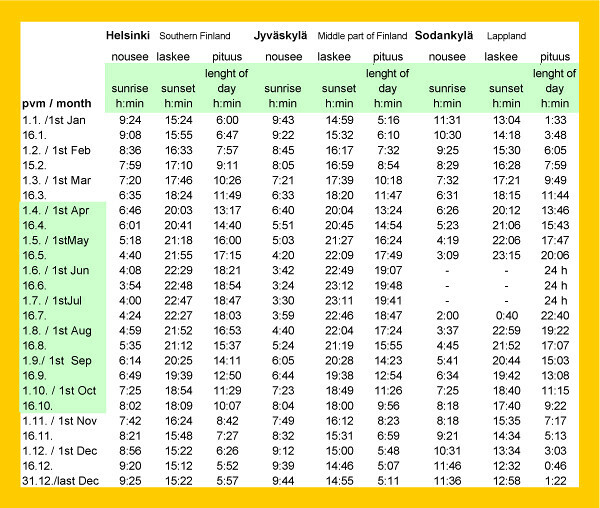 In this table from the Finnish Meteorological Institute  we can see how many daylight hours there are in Helsinki (and by extension in other places in the South of Finland), in Jyväskylä (Central Finland) and in Sodankylä (in the Finnish North – the place that was the National Center for Northern Light observation of Finland ). Exact times where the sun rises and sets in different locations across Finland. Also the length of day. Source . We can also see that data in a more visual form in this graph. I made it with the data from the Meteorological Institute. Another way to see it visually too is to see this fantastic video in time lapse  comparing a summer day and a winter day in Helsinki, one next to the other. We can see both in the graphic and the data that Sodankylä in Lapland is the place that has the most extreme changes. It is a place where we can see the Midnight Sun in the summer and the Kaamos (the polar night)  during winter. The line for Jyväskylä, 270km North of Helsinki, and the captital’s one are not as steep as the Lapland one, and are actually quite close to each other. But even like that, we have long summer days and short winter nights compared to the rest of Europe. And we finish today’s post as we started it. Besides knowing the daylight hours and the length of day that we can find in different parts of Finland, we have to take another factor into account: the clouds. This past November was unusually cloudy, but the usual level of cloudiness is actually quite high too, as we mentioned. In comparison with the countries of Southern Europe, you get as many hours of sunlight in two days as Helsinki and other Finnish places might have in a month. That can be pretty hard for those who are accustomed to lots of sunlight, even in winter. It is one of the things I miss the most while living abroad. Nature has a way of bringing balance to Finland by making natural wonders such as summer days with white nights  and the Midnight Sun. If you live in Finland, how do you manage the changes in the hours of daylight? And the cloudy winters?